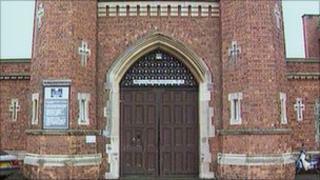 A senior Lincolnshire councillor has said he understands Lincoln Prison could be closed. Martin Hill, leader of Lincolnshire County Council, said he had learned the prison could either be changed into an immigration centre or downgraded. He said a new immigration removal centre was not needed and closing the prison would harm the local economy. The Ministry of Justice (MoJ) confirmed changes were being "considered" but the jail would not be shutting. "We are considering changes to the future role of HMP Lincoln," the MoJ said in a statement. "No decisions have been made, and there are currently no plans to close the prison. "We are committed to ensuring our Estate meets the needs of the prison population, and best suits the current capacity." Mr Hill said he had written to Justice Secretary Chris Grayling to ask whether the rumours were true and if so, requesting his input in the decision-making process. "What we are aware of and led to believe is that there are certain options being considered, one of which is an immigration centre or downgrading the prison to a lower category," said Mr Hill. "That doesn't sound very big news but it's quite important for the health of both the criminal justice system in Lincolnshire and the local economy. "There's a real need for a prison in Lincoln. It's essential for driving down reoffending rates and making sure justice is delivered locally." He added the county already had one immigration removal centre, Morton Hall, near Lincoln and there simply was not the need for another one. HMP Lincoln is a category B prison, housing about 740 adult, male inmates.